I often have people ask, “how do you come up with your designs and colors?” Well, often the final result of a design and the combinations of colors is the result of several “do overs”, otherwise known a ripping and retrying. This is especially true for abstract quilts for which I have a general idea of the color combinations and flow. It isn’t until I have the quilt top completed and step back at least 10 feet AND often take a photo (more on that in a minute) that I go…. UGH! Something isn’t right! I recently completed an art quilt called CURVES OF THE EARTH. The first draft of this quilt is shown in a picture at the top of this blog. 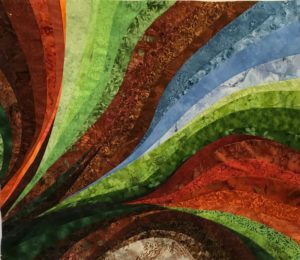 The lower quarter of the quilt had a curve that was drawn out and it didn’t meld well with the section on the above right. I looked at it for a few days and thought about what needed to change then out came the ripper and I took off the lower curved section. I made a new tighter curved section and at my husband’s recommendation, added a strip of green to the orange/rust section above. After some working and reworking to get the curves just right (before I added them to the rest of the quilt!) and a few more photos, I did the final sewing and really liked it. The second photo in this blog is the final version of the art quilt top. The last photo shown in this blog is the quilt finished, quilted and bound. Now, back to the importance of photos… I read back in the beginning of my quilting years that you must see your quilts from at least 10 feet away. My studio is probably only 10 feet wide so I’m often standing in the closet to get the important perspective. But by taking a photo you see the quilt completely differently. 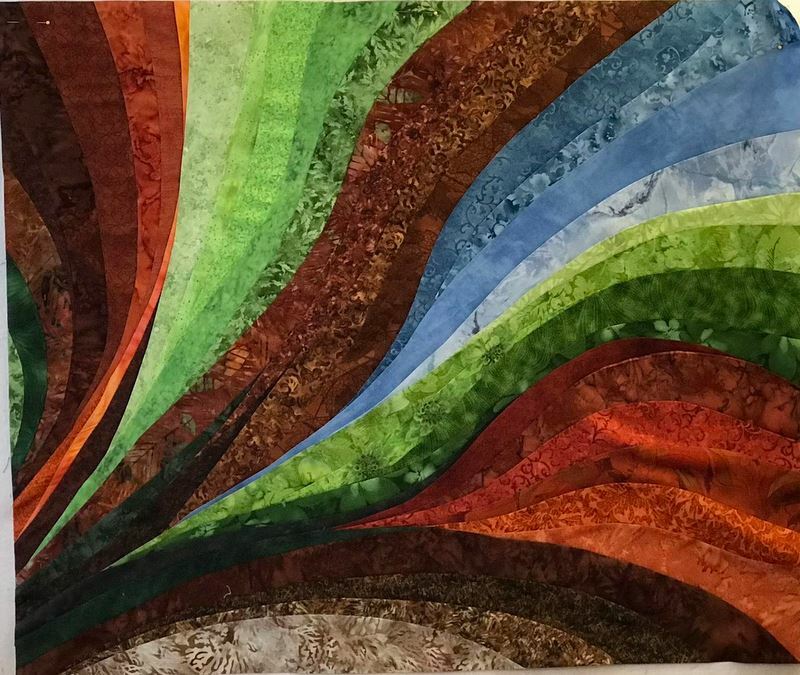 The photo lets you see how the colors and lines of the quilt work or don’t work together. The smallness of the photo, especially on my iphone, gives me an important perspective that often guides me to rip and redo or say…YES…I got it! I find that abstract design quilts are often prone to some of this ripping and redoing. 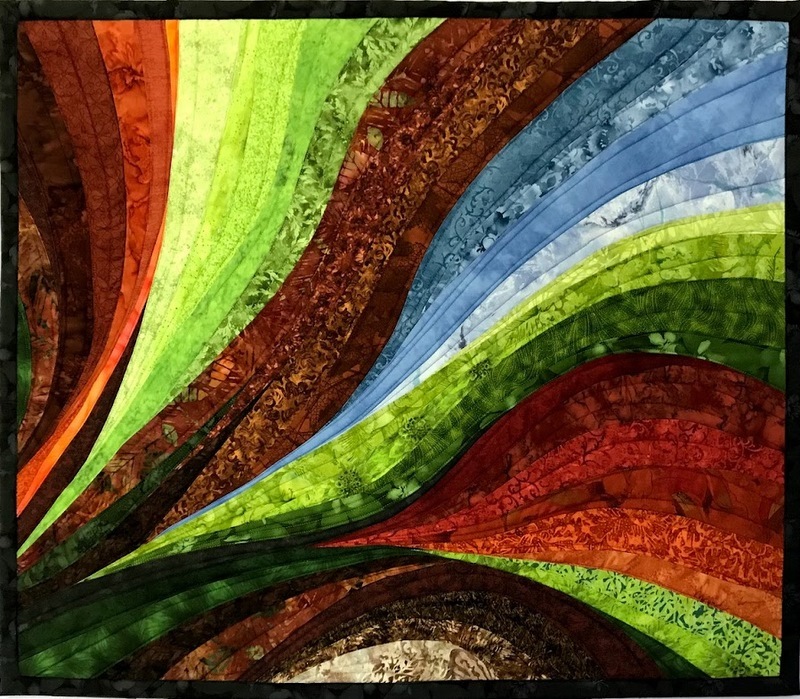 Sometimes, if the design allows, I will construct the art quilt in several sections and not do the final sew together until I’m sure the sections work the way I want. This curvy pieced quilt just didn’t work well for sectional piecing.